Today I have more El Corazon awesomeness for you guys! Have you spotted the Magic Collection? So many amazing colors jam packed with shimmer which gives them a lot of depth. 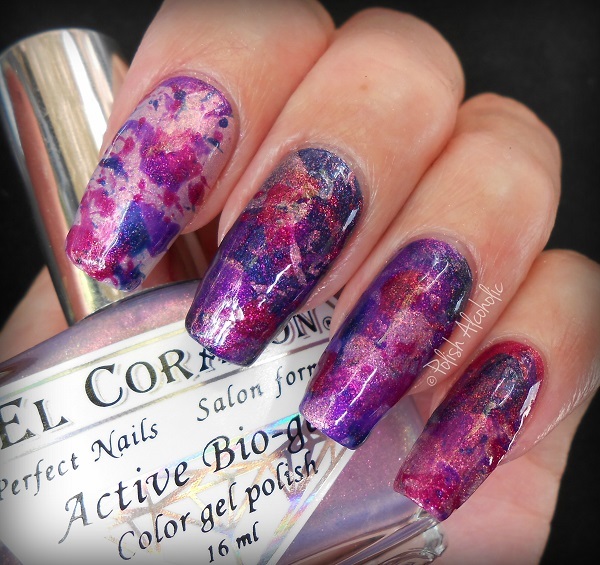 I used four shades of that collection to create a splattered look. L-R: Magic Attraction (423/554), Magic Berry Princess (423/556), Magic Tenderness (423/558), Magic of Night City (423/579): I started this mani with two coats of Magic Berry Princess (pinky), two coats of Magic Attraction (ring), two coats of Magic of Night City (middle) and three coats of Magic Tenderness (index) and waited for that to dry. By using a few straws I randomly splattered the four shades on my nails. It’s so much fun to do but it also get’s very messy (polish is not meant to be worn on ones face and hair, is it?). I love how these shades look together. Magical 😀 I added two coats of top coat for a smooth and shiney finish. Voila: El Corazon polishes are available at Hypnotic Polish for the great price of € 4,90 – € 5,50 each. (worldwide shipping). Ps. full swatches plus review of these are coming soon! *product(s) were generously provided to me by Hypnotic Polish for my unbiased review. 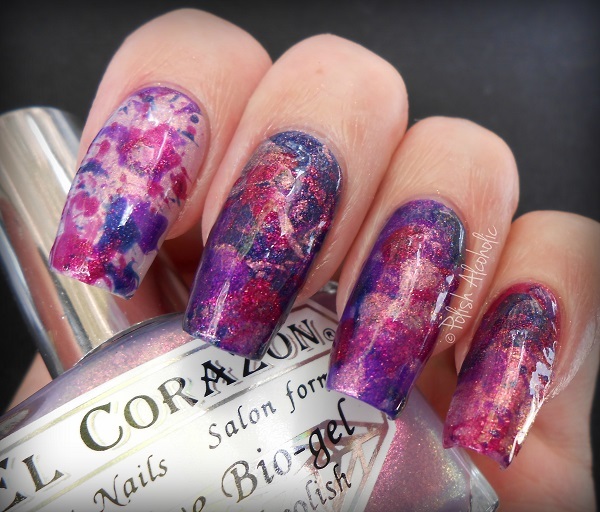 This entry was posted in El Corazon, Nail Art and tagged 423/554, 423/556, 423/558, 423/579, El Corazon, magic attraction, magic berry princess, magic collection, magic of night city, magic tenderness, nail art, nail polish, splatter, splatter nails, splattered nails by Polish Alcoholic. Bookmark the permalink. Wow. I love the way your nails look! They came out amazing!! Such pretty bottles, too – they’d look great all arranged on a little tray or a tiny cake stand as functional decorative items.